in a chorus of mute wonder. Have you found Sally Lloyd-Jones Christmas board book called Song of the Stars. 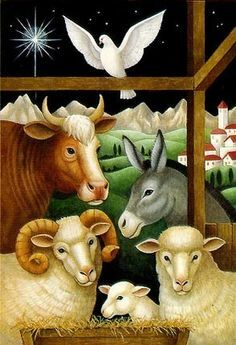 She imagines what the animals were doing to spread the word that Jesus had come. I found it to be enthralling! Your post brought it to mind. No, I haven't Michele. I'm only familiar with her Jesus Storybook Bible, I'll have to look it up. Thanks for the suggestion - I love finding new children's books. Beautiful, Kelly. I want to be both in silence & in wonder this Christmas. Thanks Joanne :) May you find your heart's desire. Struck mute by awe! All of us. Then. May it be so now too! Thanks, Kelly. I love the way you turned the legend around. That night was a time of wonder, I'm sure. I recently read about the shepherds and when they told others what they had seen, the hearers were all amazed. I just kept thinking about our pets and their silent presence which speaks so loudly in our house and how humans seem to think words are the highest form of praise. I wanted the animals to bring their own inherent gifts. I just love this...simply worded with a beautiful picture of the way I would imagine it to have been. Makes me smile with the love I have for our Christ.